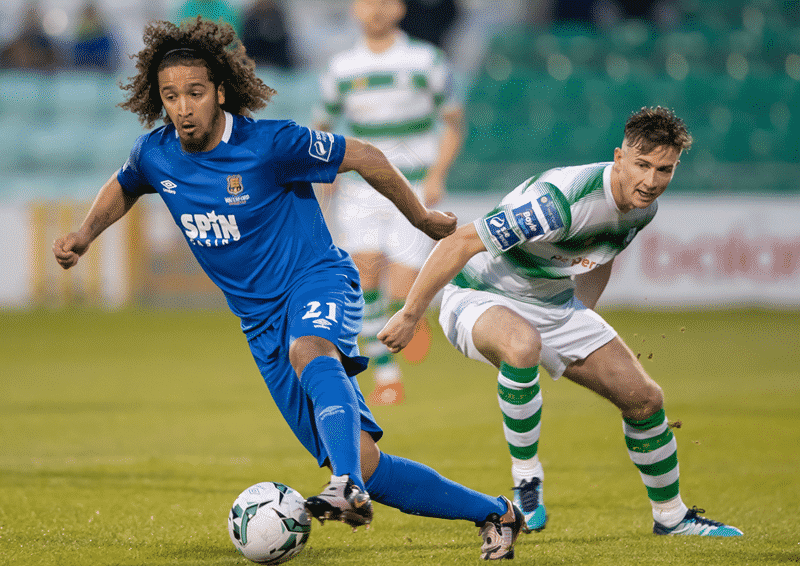 Aaron Drinan’s late goal proved only a consolation as Waterford FC lost out 2-1 to Shamrock Rovers. The Blues started well and almost took an early lead. Aaron Drinan broke down the left and played across the field to the on-rushing Zack Elbouzedi but he couldn’t get his shot on target. Shamrock Rovers’ Sean Kavanagh was off target before Bastien Hery fired wide for the Blues. Jack Byrne and Kavanagh linked up down the left as Shamrock Rover began to create chances; the latter’s cross was well collected by Waterford keeper Matthew Connor. Shamrock Rovers took the lead after 27 minutes. Aaron Greene and Trevor Clarke worked down the left and found Sean Kavanagh inside the penalty area and he shot into the bottom corner. Ronan Finn did well down the right and he put it on a plate for Aaron Greene to almost double the lead but for a vital block from centre-back Maxim Kouogun. Keeper Connor got down well to make an excellent save to deny Ronan Finn’s pinpoint header in the second half. As Alan Reynolds prepped a double change, the home side hit a sucker punch and doubled the lead. Jack Byrne whipped in the corner and found Roberto Lopes to make it 2-0. The Blues tried to get on the scoresheet as Zack Elbouzedi drove forward but his curling effort was just wide of the target. Matthew Connor saved well from Trevor Clarke before the Blues halved the deficit. Izzy Akinade did well down the left to cross; Roberto Lopes couldn’t clear and Aaron Drinan found the bottom corner of Mannus’ goal, but it was all too late.